Not sure if I subconsciously left pink till near the end because (as some of you know) it is my least favorite color in the entire spectrum. 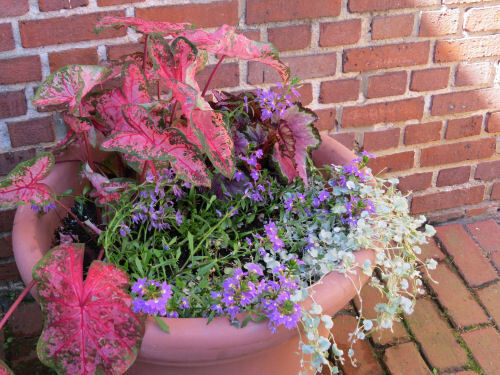 That said, although I'd never fill a garden with pink, It's still colorful. And there are lots of pink flowers. It seems to be a color the natural selection process likes. Not a single one of the ones I'm going to show you is native to this country, although most may be generally familiar as garden or house plants. 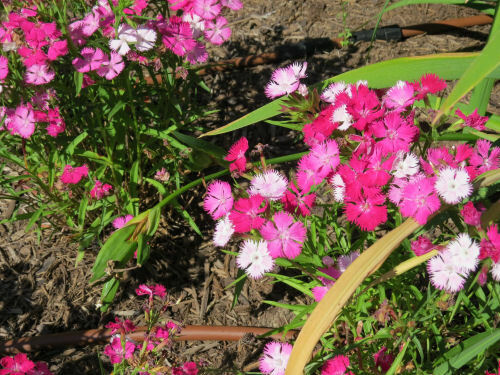 First is Dianthus, Sweet William, or Pinks. They are native to Southern Europe, but have been a common garden staple since colonial days. They do come in colors other than pink. Pinks refers to the ragged margin of the petals as if it had been cut with pinking shears. 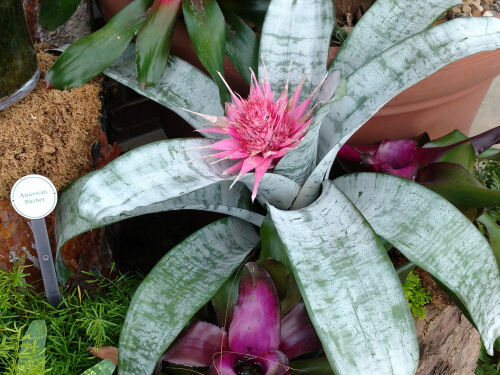 Lots of bromeliads are used as houseplants. Most are native to South America. Some are known as air plants, because they can grow by capturing water from the atmosphere. Others are more "normal." Pineapple is a bromeliad. The family is very diverse. 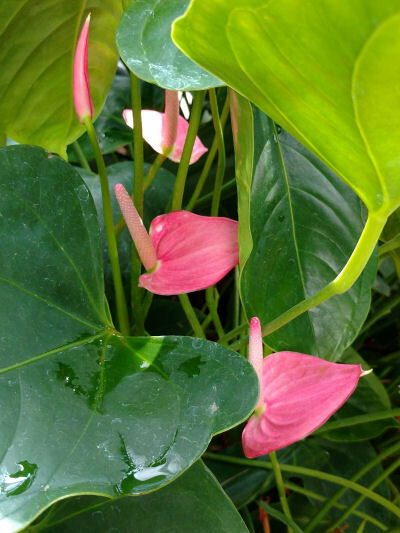 Here is a pink peace lily. The white ones show up as house plants quite often. They are members of the genus Spathiphyllum for having that spade-like leaf. They are native to South American tropics and Asia. Another familiar member of the family from our area is the Jack in the Pulpit. I saved this one for last because it was new to me. 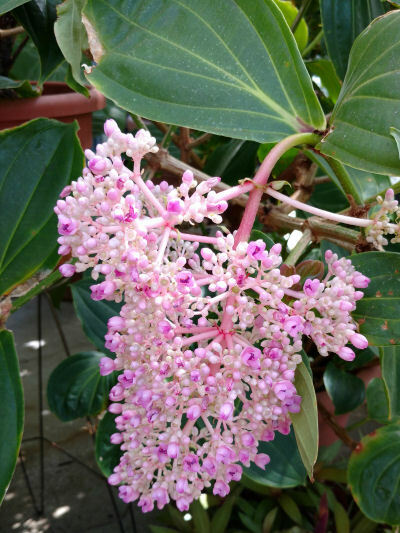 This is Medinilla. It's also native to the tropics, but is apparently becoming available for gardens as well. The label on this was Medinilla magnifica but the flower panicles aren't a match to other pictures of that which I found on line, so I don't know which information is incorrect. At any rate the clusters are quite stunning. This was maybe 8 inches long. For anyone who might have just stumbled into this post, all the flowers featured the past few days were at the gardens of the Stan Hywet mansion in Akron, Ohio. Josh is home from the hospital. Hopefully there won't be too many crises or changes for a while now. I could use a "normal" rest of week. I can remember going out in the woods in the spring with Sylvia to search for Jack in the Pulpit. We usually found some. Also thanks for the story of pinks. I wondered how they got that name.